For more information about construction and pinout of our assemblies, please read read this document. 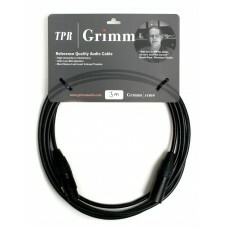 A pair of Grimm Audio TPR cables. Length is 1 meter. XLR male connector and XLR female connector..
A pair of Grimm Audio TPR cables. Length is 2 meter. XLR male connector and XLR female connector..
A pair of Grimm Audio TPR cables. Length is 3 meter. XLR male connector and XLR female connector..